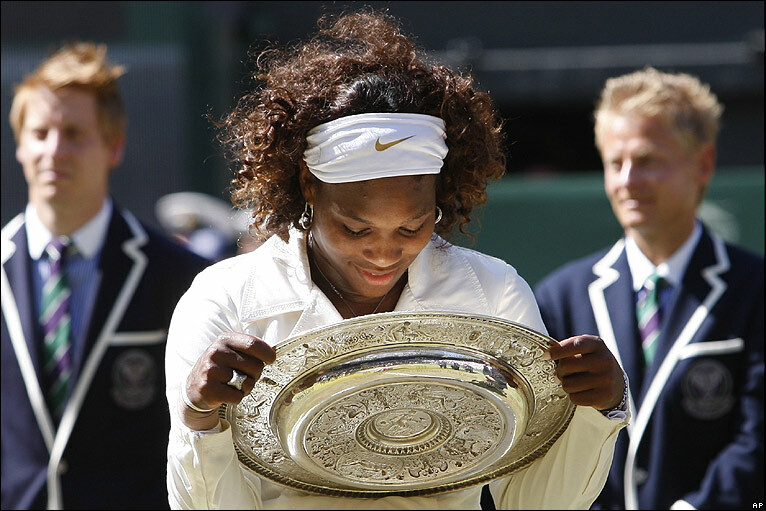 The 2009 Wimbledon Championships were blessed with two finals which despite being very different – offered a fitting degree of emotion, awe-inspiring tennis and yet more new entries in the record books. On Saturday the ladies’ final was for the fourth time contested by the Williams’ sisters: rightly back at the business end of the rankings and – for the past fortnight especially – showing exactly why they are so ahead of the pack when it comes to the Slams. Venus a five time Wimbledon champion went into the match as favourite despite her younger Serena arguably displaying the more impressive performances over her own route to the final. Venus had been solid, and at times her power game truly sparkled as she brushed aside the challenges of Agnieska Radwanska et al. This however proved to be the crucial factor – or at least a major one. Whereas Venus had indeed been impressive in her play up to the last stage she had never truly been tested. Nowhere was this better encapsulated than in her match immediately Saturday’s encounter with her sister. In Dinara Safina we have a player who can play devastating tennis over a considerable amount of time – it is this consistency that has rightfully earned her the number one ranking. However, at the highest level of the sport the Russian has repeatedly crumbled. The occasion must get into her head and – as with so many of the eastern Europeans – when things go awry there is no plan.B. A semi-final against the defending champion proved to be one of those insurmountable moments for Safina as she was swept aside 6-1, 6-0. Serena of course had to battle past a Russian who has shown consistency in a different way. Elena Dementieva has stayed consistent not just in the last six months but six years. Solid groundstrokes, an improved serve and some ever increasing belief in herself have made Dementieva a true Grand Slam contender. She did not choke in her 7-6, 5-7 6-8 loss to Serena, she was simply beaten by a champion who is back to her very best. 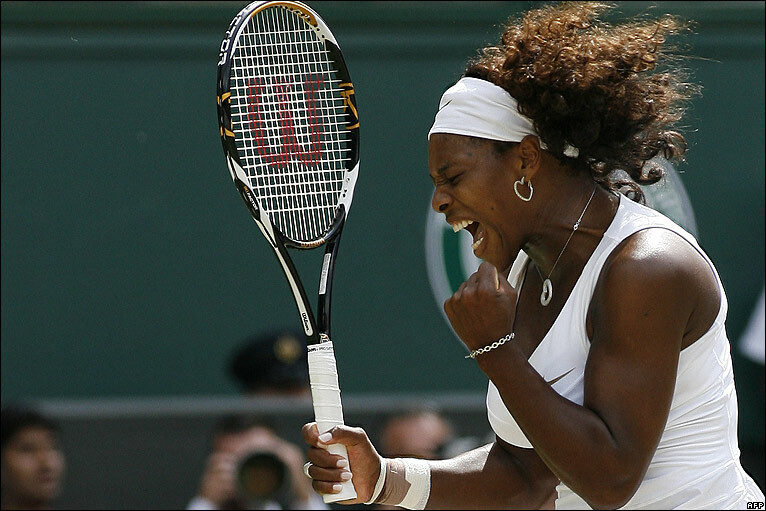 Serena has shown an unparalleled level of intensity and determination at this year’s Wimbledon. For so many years she has struggled with off court distractions, family tragedies and fitness. With such factors quelled – the ruthless, immensely powerful and most importantly clever tennis player who has returned to the women’s game. I haven’t been the biggest fan of the Williams’ over the years, but they are hard to resist with their emotional, determined and smart-thinking gameplan. They are so much more than just powerful senseless hitters. True they can hardly be described as graceful and despite their doubles success their net-play is far from the best. But they have every shot in the book and on grass, they are unstoppable. Despite her loss on Saturday, Venus is still the better grass-court player than Serena, but she simply couldn’t match her sister’s intensity after a comfortable semi-final. Ultimately, when that first set tiebreaker went to the younger Williams sibling, Venus never truly believed in herself. If Saturday’s final was a tale of one player’s raw belief proving the catalyst for victory then Sunday’s contest was the exact opposite. Further cementing a fine (and welcome) return to form for American tennis it was Andy Roddick and not the much fancied Andy Murray who faced the shoe-in Federer. The American has been the player of the tournament coming through the tough tests of a resurgent Lleyton Hewitt and then Murray himself (as well as 14,000 Brits in the Centre Court throes). He had achieved this – and by doing so confounded his many doubters and critics – by improving his all round game. Larry Stefanki’s influence has really begun to show as A-Rod’s game now possesses a full repertoire. Double backhand passing shots and a tricky one handed backhand slice have now joined that booming forehand and impossible serve. Mentally too, the American has learned to relax and once again have faith in his game in times of crisis. Against Murray he outthought his opponent – a renowned tactician – and against Federer he almost outplayed him – a renowned outplayer! With an 18-2 head to head deficit against the Swiss and two previous defeats at the same stage in 2004 and 2005 any other player would be lacking in belief. Indeed the Roddick of as little as 12 months ago would have seriously questioned if there was any point in even turning up. But this is a man who now knows he can compete with the young wave of power hitters and ultra-fit teenagers. This view was hard to find elsewhere however amongst fans, pundits and former players: the talk was all about Federer winning his 15th Grand Slam title and becoming the greatest of all time. With Pete Sampras – returning for the first time since his last match in 2002 – joining the other greats of Borg, Laver and Nastase, the stage was truly set for an historic final. But Roddick wasn’t phased either by the lack of belief of those around him (a partisan underdog-loving Centre Court not included) or by such legends of the game adding expectation. He started –as always- in top form and was dripping with confidence as much as sweat. His opponent, majestic and seemingly relaxed was nevertheless denied any chance to dictate the match. Federer – who later admitted he in fact was affected with nerved after Pistol Pete’s arrival – never reached 5th gear let alone 6th. This was not a ‘bad day at the office’ for the Swiss either – he simply wasn’t allowed to play his game. Surely too, the multi-champion struggled to come to terms with this new and improved version of an old foe. It was Roddick who looked more comfortable in longer rallies whilst it was the Swiss master pulling aces out of the bag with terrifying ease. After four tense sets and two breaks of serve – both by the American – it was another five set thriller – the third in a row at SW19. 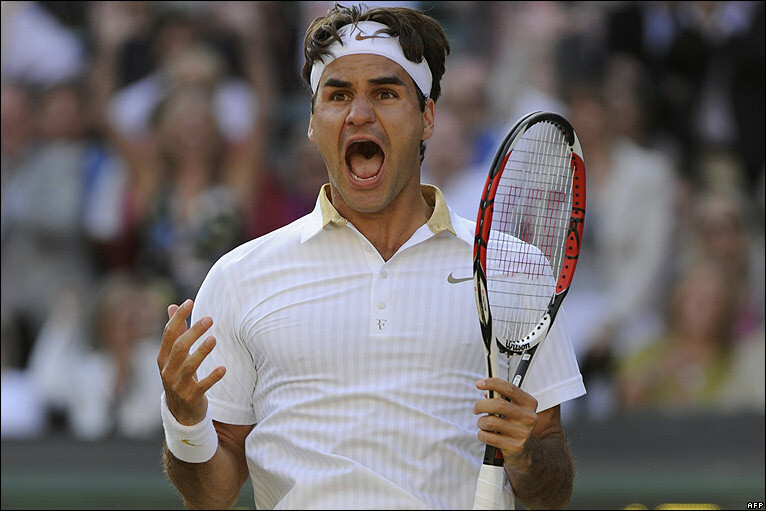 Both players had wowed the nation – Roddick with his revelatory all-round confidence and game-plan mixed with a fervent and justified belief, and Federer with his inhumane mental strength and assuredness. To come back from 2-6 down in the second set tiebreaker was all the proof needed to see that Federer’s confidence in his own abilities remained the highest. As the fifth set progressed it was Federer though who looked the more fragile – he would repeatedly lose the first or second point on his own serve and his groundstroke’s were tight and soft. 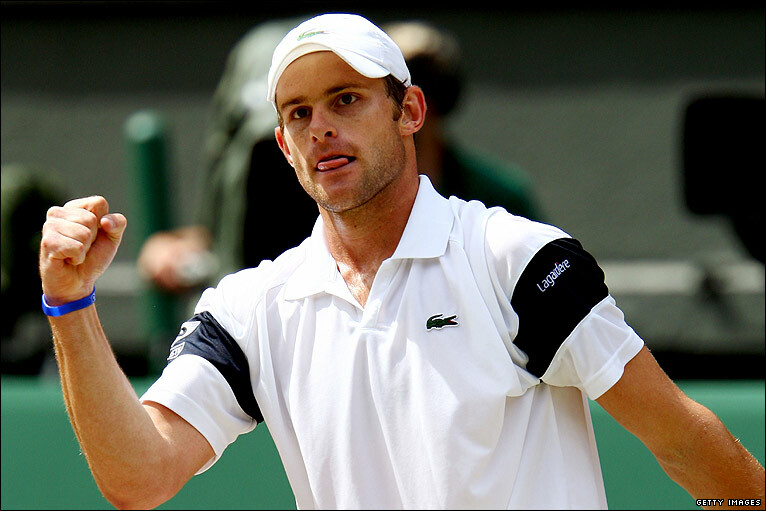 Roddick remained focused despite coming so close earlier in the match. Ultimately it was both physical and mental exhaustion that defeated the number 6 seed. It had taken him over four hours, but Roger had finally found some rhythm on the return of serve and managed to hit some shots with interest. 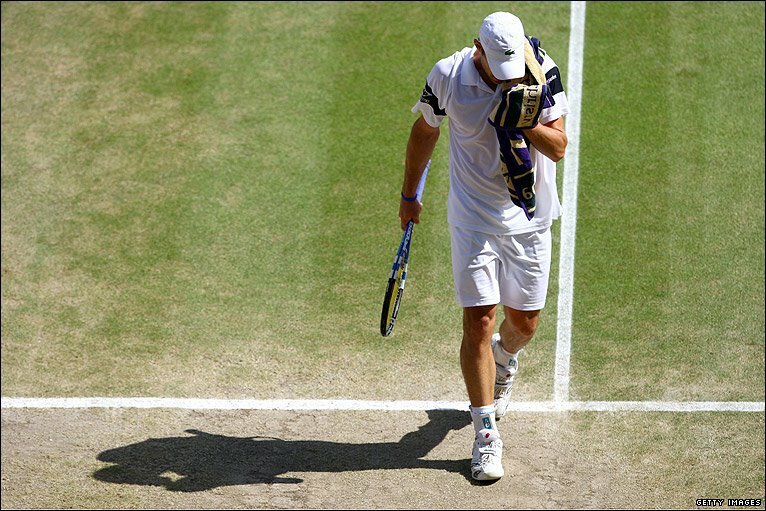 The slight shift in momentum was too much for Roddick and it was suddenly all over 5-7, 7-6, 7-6, 3-6, 16-14. Crushed and choked with emotion Roddick was graceful in defeat, apologizing to Sampras for not stopping the inevitable end of his 14-Slam record. Federer was graceful too as he rightfully congratulated his opponent for a great match – no tears this time though. Maybe he too knew that this was a match where the best man on the day had lost. Laver’s two calendar Slams, his many years spent banned from winning even more against the fact that those slams were won on just two different surfaces. Borg’s lack of overall titles against his young age of retirement and incredible feat of winning multiple back to back clay and grass slams. Sampras’ number of total Slams against a more competitive tennis profession which echoes that of Federer’s today. Simply treat these players with respect and say that they were truly the best of their respective generations. Thanks to BBC for the pics.